Introducing "Competition Karuta" that became a hot topic in the movie "Chihayafuru"! A girl's manga "Chihayufuru", written by manga writer Yuki Suetsugu, is based on a theme of "Competition Karuta". It was also animated and filmed into a movie, and Suzu Hirose who starred the movie has become a hot topic. For Japanese, "Karuta" is a game that Japanese gathered and enjoyed together with relatives and families during New Year when they are young. Even half of the Japanese has experience of playing Karuta, however more than half of them do not really know the history and rules of Karuta, as well as how to enjoy playing it. This time, we would like to explain about "Competition Karuta" to you all thoroughly! 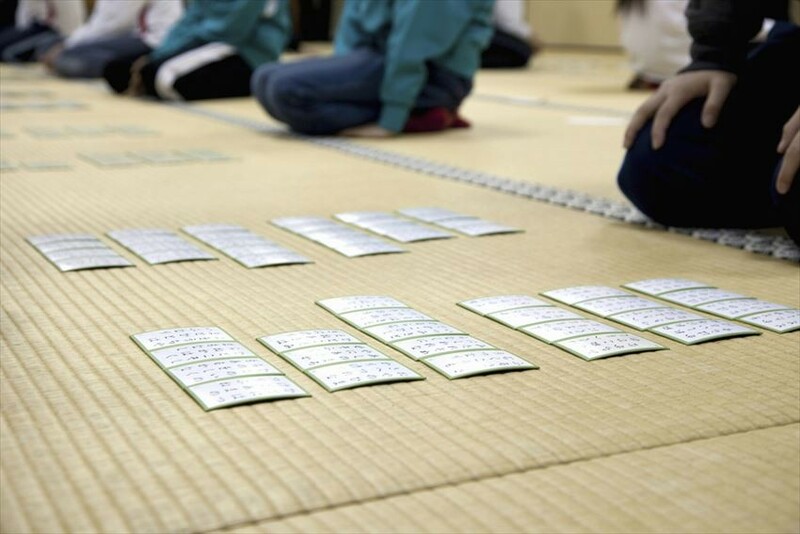 It is a competition that is played by using "Karuta" which written in "Ogura Hyakunin Isshu". " Ogura Hyakunin Isshu " is a poem collection of 100 poets, which were selected by poet Teika Fujiwara who was active from Heian period to Kamakura period. In 'Competition Karuta', the cards used are written with the 'upper phrase' and 'under phrase' of these 100 poems. After listened to the "upper phrase" which read by by the reader, the player need to take the card with the "lower phrase" as fast as possible, and the player who finish your holding card will be the winner. Besides “Competition Karuta” which played with poems of "Ogura Hyakunin Isshu", there are also "Iroha Karuta" which is played by using "Iroha poems", and all of them are passed down until current generation, and are played in New Year. 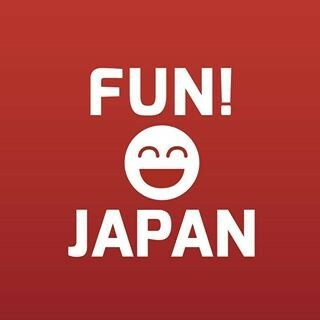 What is the history of "Competition Karuta"? It is said that in 1904 (Meiji year 37), journalist Kuroiwa Ruiko has executed the unification of game rules, etc. which has been used in traditional competition in Japan. After that, it was spreading throughout the country from Taisho to the early Showa era, and "Japan Karuta Association" was established in year 1948 (Showa 23rd) to manage the event. There are rank such as "Competitive karuta master position Queen Position final”, "Nationwide selection karuta Competition", "Female National Competition Karuta Championship" which competing for the highest rank of competition Karuto. The winner of the “Competitive karuta master position Queen Position final” will be named as master/queen. “Competitive karuta master position Queen Position final” are held at Omi Jingu, Shiga prefecture, and the final competition is aired on TV every year. What is the flow and rules of "Competition Karuta"? 1) For the individual competition, the competition is played by one person to one person. 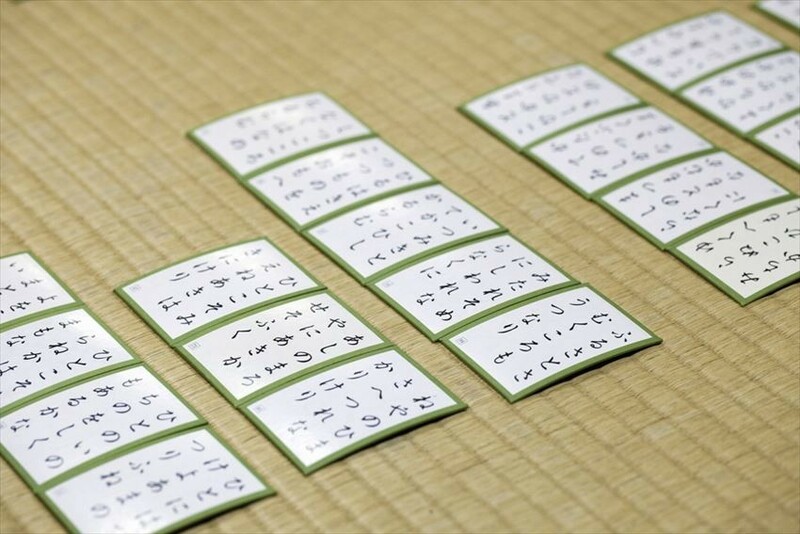 Mix well 100 cards of “Hyakunin Isshu” with the words facing down, and select 25 pieces for each player. These 25 cards are called as "mocha-satsu" and placed on the player field. It is then divided into three row and arranged freely by the player. The field which within player own territory is called as “Jijin” while the field of the opponent is called as “tekijin”. The remaining 50 sheets are not used for competition. 2) The player will be given 15 minutes to memorize the card of both your field “jijin” and opponent’s field, “tekijin”. 3) At the starting of the game, both player will pay respect to each other. Then, a poem which is not related to “Hyakunin Isshu” is read at first, the competition starts from the second poem after this. The player need to listen to the upper phrase that is read by the reader, if the card of the read one is exist, the player need to touch the card first and this action is called as "tori". If you pick up card at your own field, you managed to reduce the number of cards on your side. If you take the opponent’s field card, you can pass one card of your filed to your opponent’s field. (Okuri-satsu) After repeating this, the player who finish their card at first will be the winner. Also, there will be 50 poems which are not on either your field or opponent’s field, and is called as "Karafuda". 1) In case there are no related card on the field but the player has wrongly touch the card on field, it is called as “Otetsuki”. When your opponent did “Otetsuki”, you can send one card of your field to your opponent’s field. However, if the field you touch actually has correct card, no matter which card you touch on that field is not counted as “Otetsuki”. ・The card is on your on field but you have touched the card on your opponent’s field. ・The card is on your opponent’s field, however you have touched the card on your own field. ・The card of the read poem is not on the both field(Karafuda), but you have touched the card on the field. 2）The player is only allowed to use one hand, and is not allowed to use both hand throughout the game. You have to use the same hand which you use at the starting of the game in this match. 3）You can move the layout of the cards freely if you informed the opponent before you move. What are the tips to win in "Competition Karuta"? 1）Remember the upper phrase and the “Kimari-ji” of 100 poems for Hyakunin Isshu. In order to get the card quickly, it is a point that you know the upper phrase of all poems of “Hyakunin Isshu” and its “Kimari-ji”. A “Kimari-ji” is the letter which will help you to identify the answer after listening the few word of upper phrase. For example, a poem of "Chihayaburu Kamiyomokikazu Tatsutakaha (Upper Phrase) Karakurenanuni Midukukurutoha (Lower phrase). Even though there are two phrases begin with "chi" as follow, but since the head of both phrases are "Chigi", if you listen until "chiha" then you should can find out the answer already. These two letters are called "Kimari-ji". 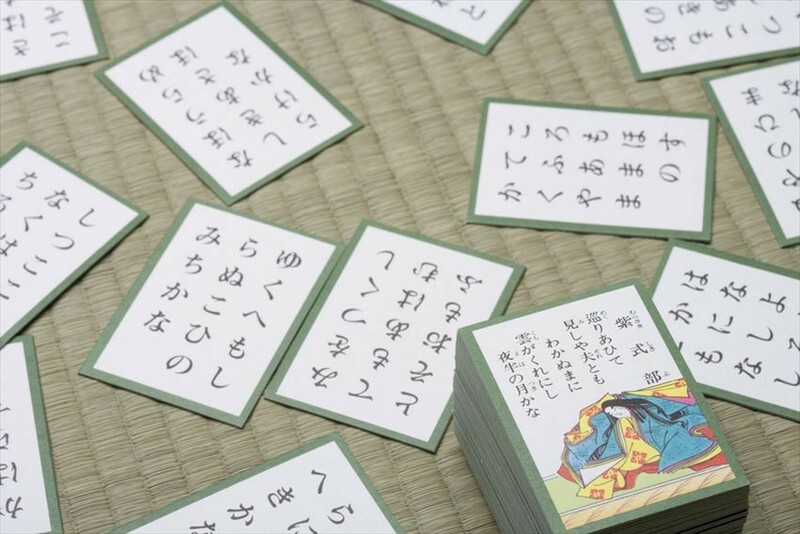 If you know "Kimari-ji", you can find out which lower phrase is it without having to listen the whole sentence of the upper phrase, and you can get the card faster and correctly. 2）Instantaneous power and concentration will help you find the card quickly after listening to upper phrase! Besides memorizing ability, you will need instantaneous power and quick reflexes to play competition Karuta. The speed of listening to the upper phrase, find out the lower phrase, find the actual card and pick up are all very important. The time limit for each game is about 90 minutes. Concentration and endurance are also essential for this competition.